Alex Jefferson from Beast of Borneo is ready to share ‘Gua!’ with the world. KUCHING: In June 2016, local game publishing company Beast of Borneo (BoB) launched the card game ‘Parang’, which players joked could start fights at Gawai reunions after too much merrymaking. BoB, together with Chameleon Design House, is back with their new game ‘Gua!’, where players take on the role of one of six different characters seeking treasures in the deepest darkest cave system in Borneo. The premise was inspired by the caves at Gunung Mulu National Park. When game creator Alex Jefferson first came to Kuching in 2012, he visited Mulu and was blown away. He had done a lot of caving since in both known caves and the ones off the beaten track. “I really enjoyed it. It was like stepping into another world. 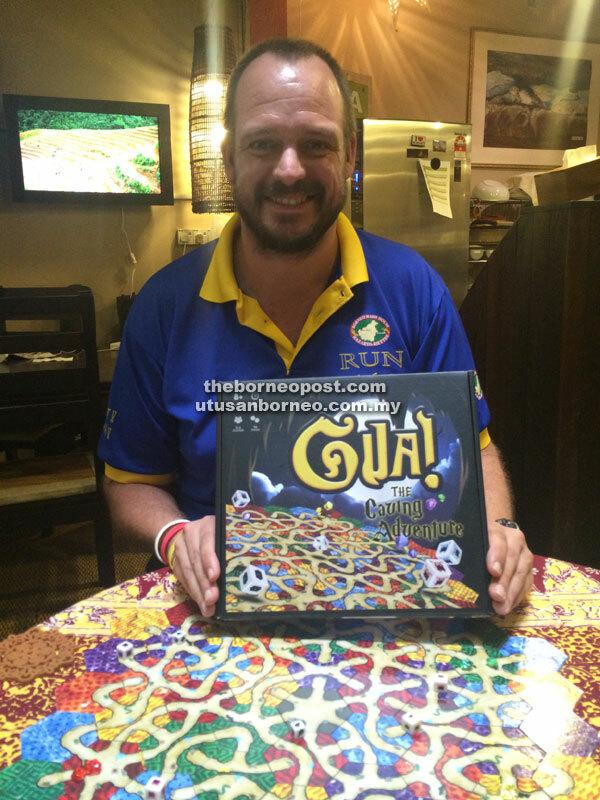 I feel that ‘Gua!’ is a good way to celebrate what Sarawak has to offer,” he told The Borneo Post yesterday. ‘Gua!’ had a delayed release because some aspects of the game were more complicated than Jefferson anticipated. The board is made up of loose hexagonal tiles, each with sections of paths on it. Each tile is colour-coded in one of six colours and patterns; the latter is to make the game accessible to those who are colourblind. Loose tiles enable players to assemble a different maze with each game. “We need enough combinations to create a maze with enough twists and turns,” he said, adding that getting all the tiles to match up with each other took many tries and many test games with his playtesters. Players can then pick one of six available characters, each with their own special ability. According to Jefferson, the characters were based on real people whom he regularly goes hiking and caving with. “However, the characters’ special abilities are solely for the game,” he added, when asked if any of his friends are jewel thieves or can walk through walls. According to the back story, adventurers learned of Gua Pelangi in the dark heart of the Borneon jungle, rumoured to contain hoards of rare gems and guarded by Orang Gua, a creature that looks suspiciously like the mascot of BoB. The first adventurer to grab a gem of each colour and make it back to the mouth of the cave wins the game. ‘Gua!’ is easy to learn and players can be on their adventure in minutes. Mastering the basics opens up more fun as players learn how to delay or sabotage opponents while advancing in the game. It is suitable for two to four players aged eight and above. Of course, BoB is already working on their next game, a cooperative game called ‘Hantu’ where all players have to work together to cleanse a haunted fort. Meanwhile, ‘Gua!’ is currently available online and at the Museum Cafe for RM130 a box. The official launch will be on Jan 21. For more information, visit http://beastofborneo.com.